Are we considering this from a aesthetic or utility perspective? An aesthetic perspective may wish to have the pants only cover the back legs because it feels more familiar. With a utility perspective, the purpose of pants could be defined as protecting the legs from the elements. Since both the front and back legs have thinner fur than the body and all would need to be guarded against the cold, the four leg option is the obvious choice. @wynaut, that’s what I was thinking. 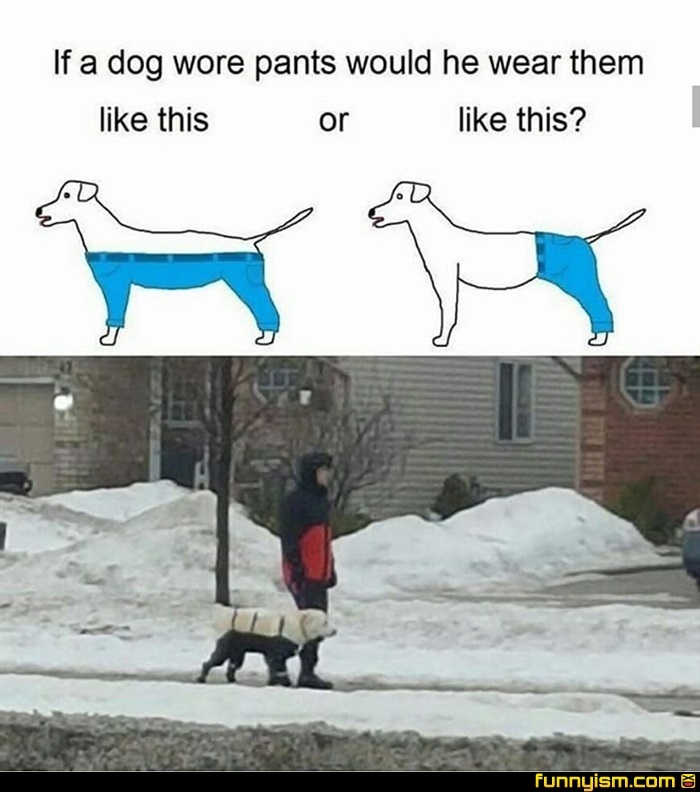 Probably a lot more bearable for the dog to walk through some tall snow with pants like that. @Beggar Mugger, Hey, just because he’s wearing suspenders instead of a belt doesn’t mean he should feel bad! He’s a good dog, BM.